Are you getting this set @GI_SnakeEyes ? Agree with you guys on the new look Chucky. Looks nothing like the original. Looks like he's gone full CGI going by the mouth on that new one. I have the awesome original digipack box set from the U.S. I'll just get the new film separately when it gets cheap. This has the potential to be really nice slipcover though if they give it a decent finish. 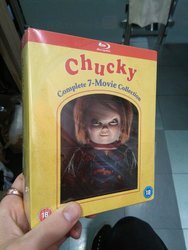 will Childs play have the shout factory version? Is the USA edition got lent cover? So you think this uk edition might be same as us edition? I hope the UK release as a nice sturdy slipcase like the USA version and not some wafer thin crap. Thanks for the heads up! Not surprised the UK gets the cheaper looking version as usual. Yep i know and i was too late yo cancel as well would have preferred the us edition but never mind.